This year saw the ten-year anniversary of Maroon 5's multi-platinum debut-album, 'Songs About Jane', slip quietly past with a re-release and a few dates, but nothing fancy, nothing brash or anything as in-your-face as a global tour. The last time the UK witnessed any action from Adam Levine's gang on tour was back in 2011, which makes the prospect of seeing them over here again just that little bit more enticing for fans of their slick soul-pop. In the U.S., however, Levine has been a judge on their version of TV talent-series The Voice, a shoe-in for the premier of their most recent hit single. In the interim, between then and now, Maroon 5 have recently released their fourth long-player, 'Overexposed', a collection that saw the band return to the sort of successful territory achieved with 'Songs About Jane' and the follow-up sophomore set, 'It Won't Be Soon Before Long'. Reaching number 2 in both the US and the UK, the album included that TV-premiered monster number 1 single, 'Payphone' (featuring Wiz Khalifa) and the flop follow-up 'One More Night' - mixed fortunes, but not mixed enough to stop the band from announcing some serious activity next year. 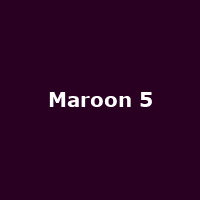 If you're a Maroon 5 fan, June 2013 is a time to set on your calendar - the band will be touring UK and Ireland arenas with Birmingham being the first stop on the 22nd, followed by London, Manchester, Glasgow and finally Dublin. We will have tickets on sale from Friday 14th September, priced at £37.50 for regionals and £40 for London's O2 Arena show. Dublin's gig will cost €39.50 - €44.50.